For the last two mornings I've detoured eight or nine miles on the way to work, hoping for another chance at photographing the egret. No luck; it was only there Tuesday and Wednesday. Last fall two egrets spent several days in the marsh. I took the picture with my cell phone, from across the road to the back of the marsh, and definitely before I discovered the camera had a zoom function. Alain suggested we might be too far north for egrets, so I consulted my Ohio bird book, which places them along the Lake Erie shoreline in summer and found in migration in the rest of Ohio in summers. We have an abundance of shallow wetlands in the valley, and are fewer than twenty miles from their summer habitat. Added to my sighting in the fall, I thought perhaps I could find more egrets. According to what I've read on the internet egrets are uncommon in the area. 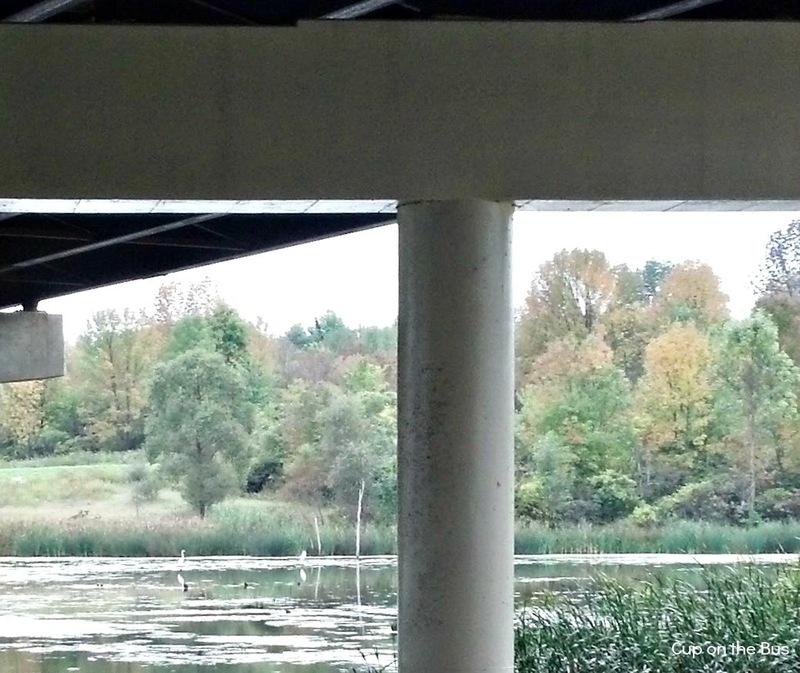 Apparently there will be no more unless there is another layover under the overpass this fall. I turned up little additional information about egrets in the valley. One photographer added an egret to his portfolio of Cuyahoga Valley egrets this past January; another blogger has a series of egret photos taken near Lake Erie. He was not pleased with the overcast except that it prevented “blowout” of the white in bright sunlight. So, my egret is suffering “white blowout,” a lovely and certainly technical photographic term. Until fall, then, when I may have my photographic brains all together, here is my impressionistic egret one more time, and I hope we meet again. Just want you to know... I usually can read your blog (which is one of my very favorites... and... one of these days I'm gonna get your way and we'll have lunch... or tea or something)... but... back on track... with the blasted internet here too often it times out before I can comment. Looks like a snowy egret? hope you see it soon. I know if anyone can find one, you will. I think we have them here but not in Sydney, and ours are a bit different in colour. We've had a greater variety of birds here this spring than ever before...even the birds know we need a boost after that winter. It is beautiful - and if anyone can track it down you will. I agree with Elephant's Child, Joanne...if anyone can track it down, you will! I never get to see these birds in my area. I do hope you get to see him/her again! I bet you'll always have your eyes opened looking. Half the fun is the searching...enjoy!